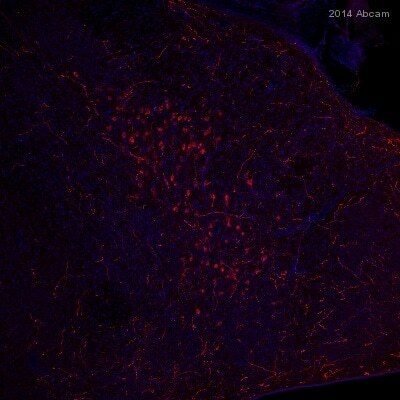 Immunohistochemical analysis of rat brain indicates a good specificity for this serum. Synthetic peptide corresponding to Cow Orexin A aa 14-33 conjugated to Keyhole Limpet Haemocyanin (KLH) (Glutaraldehyde). Our Abpromise guarantee covers the use of ab6214 in the following tested applications. Following perfusion fixation with 4% PFA, cryoprotect the tissue in 20% sucrose overnight. Cut on cryostat sections for free floating IHC. Incubate primary antibody for 48 hrs at 4°C. Orexin A (hypocretin 1) a 33 amino acid peptide and orexin B (hypocretin 2), a 28 amino acid peptide, are both derived from a common 130 amino acid precursor, prepro orexin. Orexin A and Orexin B stimulate food consumption when administered intracerebroventricularly to rats. Orexin gene expression in the brain is highly restricted to distinct populations of neurons located in specific hypothalamic regions, including the lateral hypothalamic area (LHA), a region implicated in feeding behaviour. Orexin A and orexin B bind to and activate two closely related G protein coupled receptors (GPCRs), termed Orexin 1 (OX1) and Orexin 2 (OX2) receptors. Dysfunction of the orexin peptide system has been linked to narcolepsy. Rough endoplasmic reticulum. Cytoplasmic vesicle. Cell junction, synapse. Note: Associated with perikaryal rough endoplasmic reticulum as well as cytoplasmic large granular vesicles at synapses. ab6214 staining Pan Orexin in mouse brain tissue sections by Immunohistochemistry (PFA fixed free floating sections). Tissue samples were fixed with paraformaldehyde, permeablized with 1% Triton X-100 and blocked with 1% BSA for 10 minutes at room temperature. The sample was incubated with primary antibody (1/2000 in 1X PBS + 0.1% Triton X-100 + 1% BSA) at 4°C for 24 hours. An Alexa Fluor® 594-conjugated donkey anti-rabbit IgG polyclonal (1/1000) was used as the secondary antibody. Immunohistochemical staining of orexin A in rat lateral hypothalamus useing Anti-Orexin A antibody (ab6214) at 1:50000 dilution. The primary antibody was detected with the biotinylated secondary antibody-ABC method and nickel-diaminobenzidine chromogen. Immunohistochemical staining of orexin A in rat zona incerta neurons using Rabbit antibody to Orexin A (ab6214) at a dilution of 1 in 1000. Publishing research using ab6214? Please let us know so that we can cite the reference in this datasheet. Thank you for your enquiry regarding the peptide immunogen used to generate ab6214 -- Rabbit polyclonal to Orexin A. I am afraid that we do not have stocks of this peptide here at Abcam so I am unable to send you a free sample for your control experiments.